This colourful and exotic looking 'trumpet vine' is the perfect exotic climber to bring a taste of the Mediterranean to your patio this summer! Bearing the classic 'trumpet' shaped flowers from which they bear their name, they're a magnet to bees and butterflies. Create the most wonderful bold and bright climbing display that’s ideal for growing around terraced and patio areas where the colourful blooms will smother walls and structures in a profusion of flowers through the summer each and every year. 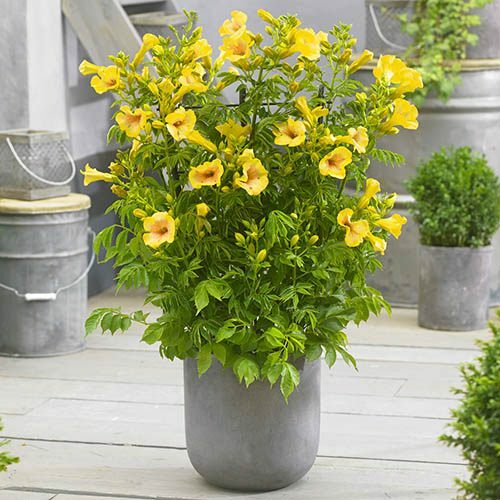 Bearing the classic ‘trumpet’ shaped flowers from which they bear their name, the contrast between the bright yellow flowers against the backdrops of glossy green leaves is a real eye-catcher.